Steven (Chicagoland, United States) on 24 February 2016 in Animal & Insect and Portfolio. In May of 2006, Lady Baltimore was found injured on Juneau's Douglas Island. She had been shot in her beak and the wrist of her right wing. Also, her left eye is completely blind from a detached retina . The impact of the bullet through her beak may have been the cause of the detached retina. With only one working eye, she doesn't have depth perception. Because of this, she has a tendency to run into things and wouldn't be able to hunt for her own food in the wild. The injury to her wing prevents her from achieving lift above six feet into the air. She is not releasable to the wild because these injuries are permanent and she would not survive on her own. The poacher was never caught. They provide treatment and rehabilitation for injured wild birds from all over Southeast Alaska; and they provide education about wildlife to the public. Photo captured on September 16, 2015. A very fine portrait to accompany this sad story . . good to know she is in safe hands. A beautiful and powerful bird. The details are impressive. Poor girl! I'm glad she was found and saved. You have taken a beautiful portrait of this still proud bird. Poachers makke me sick! Still looks great ! So majestic. It must be terrible when she was injured and alone ...A superb portrait ! a sad story with a happy end at least, and a terrific avian portrait! what a majestic bird ... no wonder it's a national symbol, too! Beautiful and unique photo - nature and its resilience is so inspiring and you capture that so well in this image and accompanying story. A spectacular portrait-type picture of this magnificent bird. Wonderful pose. She cannot be free but at least she is being taken care. Quel rapace et vue quel bec jaune et ce blanc et noir fantastique. Excellent photo. 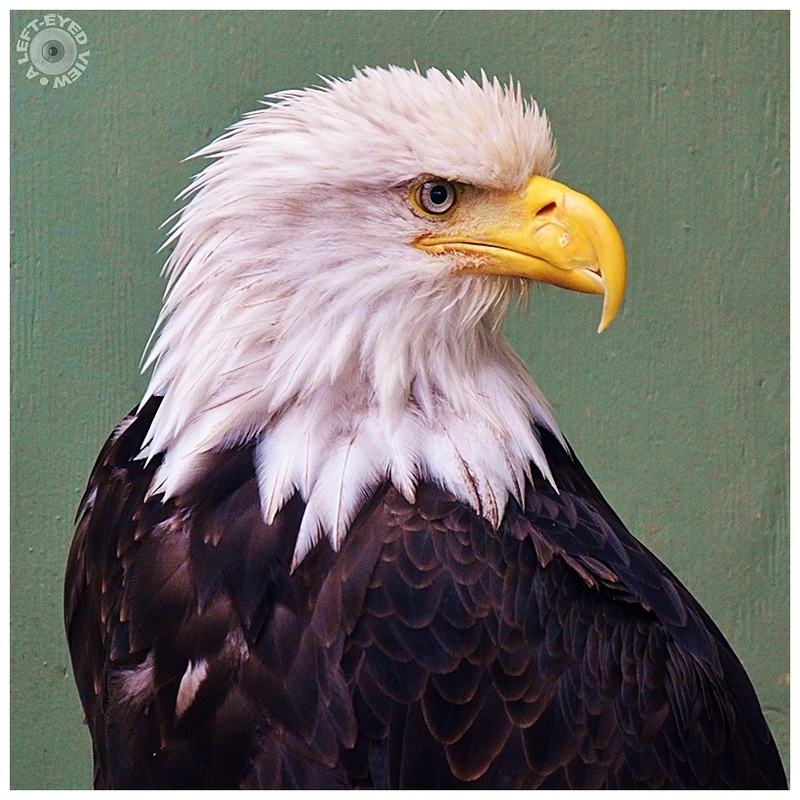 These bird rescue organizations also allow us to see these magnificent birds up close. Wonderfully exposed portrait!! Great details! That's definitely a great story behind a good portrait. Amazing. Thanks for sharing ! What a beauty. Great shot. This is an excellent photo of this majestic bird ... thank you for the informative narrative - it is a shame that the poacher was never caught. Hopefully it is still an open investigation. A gorgeous portrait! This is just fabulous. I am glad that they were able to save her, I read in the newspaper that 9 bald eagles were found dead on the eastern shore of Maryland. They are still trying to determine if they were poisoned, maybe by poisoning mice and then the birds ate them. It was very sad. A beautiful portrait. The world is full of idiots. That poacher is major league. A wonderful portrait of this regal bird. Thank you for sharing her sad story, and for your efforts to maintain her health.